One of the biggest crowds in ECU baseball history, easily the biggest crowd of the season, was on deck but there wasn’t much to cheer for. It took a struggling hitter to open the floodgates for a struggling offense, but once he did they could not be stopped. Brady Lloyd lined a solo home run to left field, his first extra base hit of the season, to break the scoreless tie and the rest of the offense picked up the slack en route to a 6-1 win for ECU (22-6, 6-0 AAC) over Duke (14-15, 3-9 ACC). ECU’s win streak is now up to 10, while the Blue Devils drop a game below .500. In its first home game in 10 days, the Pirates won in front of a crowd of 4,744, a season high and the 15th highest mark in ECU baseball history. “4,700 screaming, that will get you going a little bit. It also makes it harder on their pitchers,” ECU outfielder Bryant Packard said. ECU evened the season series between the two teams with the win. Duke defeated ECU 7-2 in Durham back on Mar. 12. That was a different Duke team however, which was 11-5 when it played ECU the first time but was just 14-14 coming into the rematch before the Pirates put them below .500. Lloyd had been struggling, being hitless in the last three games against USF. He had not recorded a multi-hit game since Mar. 10 against Marist. Lloyd came in to Wednesday’s game with a .238 batting average. Lloyd went 2-for-4 with an RBI and two runs scored. “It feels real good. I don’t hit many home runs so when I do it’s awesome,” Lloyd said. After Lloyd’s solo shot, the Pirates added two more runs in the three-run fifth inning. Jake Washer walked, Packard doubled, a wild pitch scored Washer and moved Packard to third base. A Lane Hoover single scored Packard to make it 3-0. Duke also had two passed balls in the inning on top of the wild pitch. ECU added three more runs in the sixth inning when Thomas Francisco walked, Lloyd laid down a bunt single and Washer singled Francisco home. Lloyd scored on a Nick Barber groundout. Packard then followed it up with a single to left field to score Washer. “It was a complete effort. The defense was really good too. It was Pirate baseball,” Packard said. Ryder Giles made his first career start. In what Packard said was “a bullpen day” according to ECU head coach Cliff Godwin, Giles went just 3.0 innings, gave up no runs on just two hits and threw only 30 pitches. Giles first eight appearances came out of the bullpen and, other than one other game he threw 28 pitches, he hasn’t reached 10 pitches in an outing. He still has a 0.00 ERA through 11.1 innings pitched this season. Duke starter Cooper Stinson pitched 4.2 innings, giving up three runs on six hits and 90 pitches. Trey Benton came in and pitched the next 2.1 innings scoreless before loading the bases and being relieved in favor of Sam Lanier, who struck out back-to-back batters to leave the bases loaded. “I knew that Trey had thrown really well before me, so it was really big to not let his runs score. It was awesome. He gave me a big hug when we came to the dugout and it was really good to see Trey on point tonight,” Lanier said. Benton has struggled with consistency this season. It was his first time going more than two innings without allowing a single run since the opening series against Radford, when he threw 2.1 scoreless innings. Benton threw 2.0 scoreless innings against Elon but also gave up four runs in 2.2 innings against Marist. Benton didn’t pitch in the next six games after that outing. Godwin said that Benton was “the old Trey” tonight. It was very close to being a shutout. Zach Barnes and Cam Colmore each threw one scoreless inning of relief. Evan Odum came on to pitch the ninth and got to two outs before a single dropped in front of a diving Dusty Baker in center field scored the Blue Devil’s lone run of the game. After playing its first home game since Mar. 24, ECU gets back on the road for a series against Houston. Friday’s game starts at 7:35 p.m. The Pirates won’t be back at home until Apr. 18. Nate Harvey playing at ECU. The last few months for former ECU defensive end Nate Harvey has featured a lot, from thinking he would play college football another season to all of a sudden needing to scramble for the NFL. Some would consider those last few months a bit of a roller coaster, Harvey included. Harvey had begun spring practice with ECU and was convinced, along with many others that he would get an extra year of eligibility from the NCAA after playing only a handful of snaps his freshman season at another school. But, after a lengthy wait, the NCAA denied him that extra year of eligibility, a questionable move to say the least. Still, Harvey impressed and drew a lot of intrigue at ECU’s annual pro day which took place on Thursday morning inside Dowdy-Ficklen Stadium. Many teams were in touch with Harvey, including the Panthers, Browns, Texans, Giants and Rams among others. Harvey said those teams told him he had a good day and that he should keep working hard. That’s even more impressive considering Harvey had hardly any time to prepare for NFL scouts Harvey only got nine days to train specifically for pro day and now for the NFL draft. Harvey had even already practiced with ECU, and is still juggling classes at ECU. “(The appeal process and the NCAA’s decision) took so long and I practiced on the first day so in my head I’m already back. Then after that first day they told me I wasn’t,” Harvey said. But despite being complimented on his pro day, Harvey doesn’t want them to pay too much attention to the numbers he put up at pro day. He instead wants them to look at his film from his lone season at defensive end, when he was the AAC DPOY. Harvey’s award-winning season saw him average 2.1 tackles for loss per game, and record 63 tackles, 14.5 sacks and two forced fumbles. 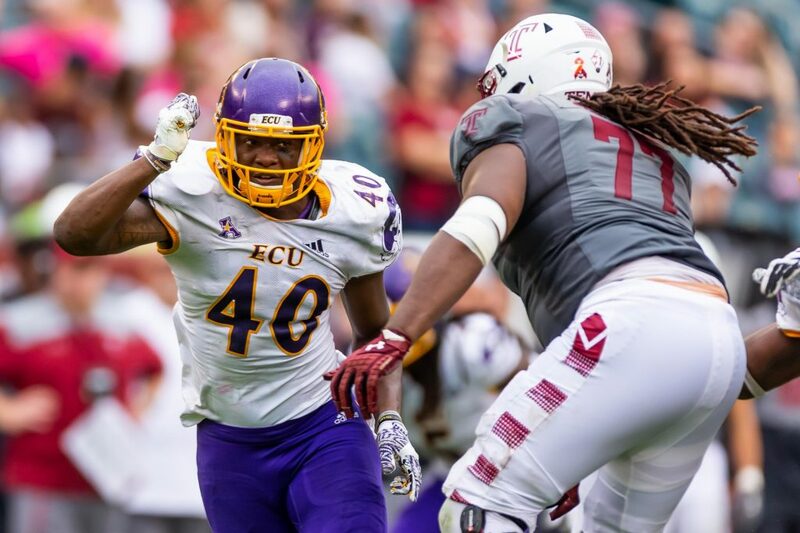 Harvey set ECU and AAC records for tackles for loss in a season and tied the AAC single-season sack record. “I feel like my film is everything. I put my heart into last season, and next season whoever I’m playing for I’m gonna put my heart into it again,” Harvey said. There’s no reason to think Harvey isn’t just scratching the surface of his defensive line prowess considering he only played it one season at ECU and excelled. Harvey started as a walk-on fullback before switching to linebacker and eventually moving to defensive end right before the 2018 season for then-defensive coordinator David Blackwell. Harvey even said himself that he was “learning on the fly” last year and the position can become more natural to him. ECU head coach Mike Houston only had a few months with Harvey after taking the job. Despite briefly working together, Harvey won Houston over and the coach has said he will do anything he can to help Harvey make it there. Houston made such an impression on Harvey as well so that Harvey was holding back tears the day he found out the NCAA had denied his extra season of eligibility. Harvey has no hesitation in returning the complimentary attitude back to Houston. Harvey is still in the process of signing an agent and getting comfortable in going through the NFL process. Despite going through a rollercoaster last few months that would shake a lot of people, Harvey is still absolutely sure in one thing. ECU opened up its AAC conference schedule with a wild 13-8 win over UCF, a team who has won five of its last six including against nationally-ranked Florida State. ECU was coming off of a sweep over Maryland. Things got testy: In the fifth inning when Matthew Mika hit a three-run home run off of Jake Agnos, Mika pimped it by carrying his bat to first base before dropping it. ECU head coach Cliff Godwin wasn’t happy and confronted the UCF third base coach. Next batter, Agnos threw the first pitch up and in as a warning. Umpires warned both dugouts. ECU had a quick team meeting in the dugout between innings. Godwin on the situation: “Mika’s a very good player, but he doesn’t need to do that. I’ve known their third base coach for a long time and he apologized to me afterward. But I’m not going to have someone disrespect our team like that. When you’re at first base and flip the bat at first base, I’m not into the new school baseball stuff. That’s not right and not the way to play the game. Godwin, continued: “I went out to the mound to tell Jake and Washer to make sure we don’t hit this guy. Then, of course, Jake misses his spot and it looked like I told him I wanted to hit him. But that wasn’t the case,” Godwin said. Alec Burleson’s take on it: “I saw him at first later on and he apologized. He said he didn’t mean anything by it and he seemed cool,” Burleson said. Both coaches were content with their starters struggling in order to eat innings: UCF starter Chris Williams gave up 10 runs in the first 2.2 innings but lasted 4.0 innings. Agnos gave up six runs in 4.1 innings of work. Agnos got to nine strikeouts and fanned two batters in each of first three innings. ECU pitchers struck out a UCF batter to end the inning in 7 out of 9 innings. The Pirate offense was rolling: ECU recorded seven 2-out RBIs and scored nine runs with two outs. Spencer Brickhouse, Lane Hoover, Bryant Packard, and Jake Washer all combined for four doubles. ECU scored in four consecutive innings and the fifth inning was the first time ECU was retired in order. “I thought it was good for our offense to have a really good approach against a really good arm. The guy’s a fifth-year senior, he’s been in the league and he’s tough. We put together a lot of quality at-bats the first three innings,” Godwin said. UCF returned the fireworks: The Golden Knights blasted three home runs and plated eight runs themselves. “They’re really good offensively and when we made mistakes defensively and on the mound they made us pay,” Godwin said. Top of the order pop: Packard, Hoover, and Brickhouse hit 1-2-3 in ECU lineup and went a combined 7-for-13 with eight RBI’s and six runs scored. Burleson saves the day: UCF was coming back on ECU late when Godwin put Burleson into the game and Burleson responded with two innings and three strikeouts to stop the momentum. Insurance runs: Dusty Baker gives insurance with his first-ever home run in the eighth inning to make it 12-8. Dugout went crazy for him. A Brickhouse RBI triple made it 13-8 in the same inning. ECU will go for the series win tomorrow at 4:10 p.m. with Tyler Smith getting the start. No. 14 ECU lost 7-2 to No. 24 Duke in Durham Tuesday afternoon. The loss snaps a four-game winning streak for the Pirates and sets them back to 12-6 while the Blue Devils improve to 12-5. The streak: ECU had dominated Duke in baseball for quite some time, as this game snapped what was a 17-game winning streak against the Blue Devils. The last time Duke had defeated ECU was May 10, 1998. Of course Duke lost to ECU last season but still managed a 45-18 season and came just one win away from the College world Series. Bad start: ECU pitcher Gavin Williams had made three good starts to begin the season but simply didn’t have his best stuff in this game. Williams gave up five runs and only was able to get through the first inning. After getting the leadoff hitter out, the next four batters reached base to get the Blue Devils on the board. From there it was a fielder’s choice and two more hits that led to the five run lead. ECU head coach Cliff Godwin told reporters that Williams was up in the zone and also down the middle, which he hadn’t done yet this year. Still great: Jake Kuchmaner received AAC pitcher-of-the-week and one of Collegiate Baseball’s national player-of-the-week awards after his 8.2 innings of no-hit baseball against top-10 Ole Miss last Wednesday. Kuchmaner did well against Duke, salvaging the game somewhat. Kuchmaner pitched 5.2 innings of relief and allowed just one run on one hit. Evan Voliva allowed the last Duke run after Kuchmaner. No edge: Despite ECU’s great bullpen pitching continuing, Duke’s bullpen pitched great as well. Three different relievers combined to throw 4.1 scoreless innings and only allow two hits. 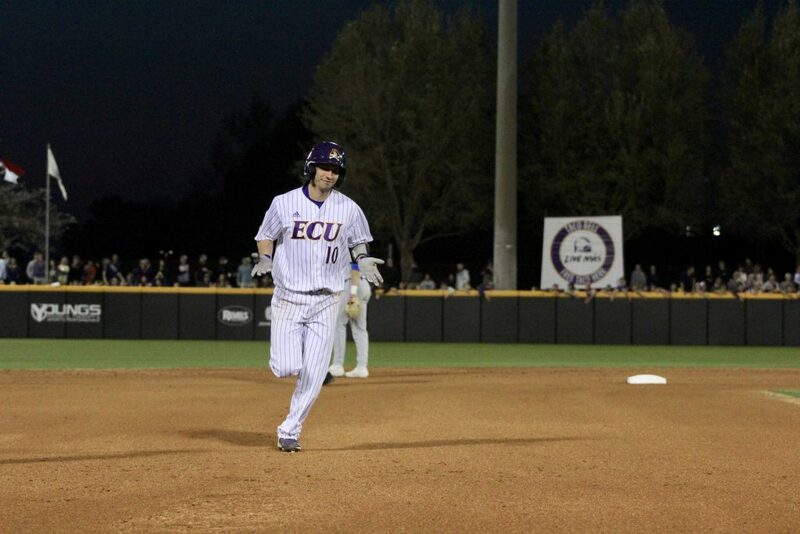 ECU’s offense managed just four hits total as a team, and two of those were Alec Burleson’s. The Pirates got on the board in the third inning with Turner Brown reaching on a fielder’s choice that scored Ryder Giles. They got their second run in the fifth inning when Burleson singled that scored Giles again. ECU now turns its attention toward College Park, Maryland for a matchup with Maryland. Maryland came to Greenville last season for a weekend series at Clark-LeClair and ECU absolutely dominated the matchup. The Pirates swept the series and outscored Maryland 26-4 over the three games.